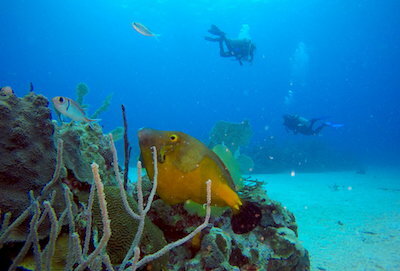 How is Scuba Diving in Punta Cana ? That is a question we receive almost daily. It really doesn’t matter as much if you book a hotel in Punta Cana or in Bayahibe / La Romana these days. With the new highway the ride is short, so more and more divers come and enjoy the dive sites in our area. What is the difference and why you should consider scuba diving with us? Beside diving and snorkeling in a small private group just with your family and friends, don’t forget that Punta Cana is on the Atlantic coast, so the waters are not as calm as here. And because of the wavy conditions, the visibility might not be as good either. We are on the south, the Caribbean side and most of the time the sea in our area is like a mirror, blue turquoise water with the usual visibility 100 ft plus. Book 2 divers for a full day trip to The Natural Pool with us for 295 USD per diver (refreshment, drinks, lunch, equipment, private taxi from Punta Cana / Bavaro and back included), add 3 and more divers for only 245 USD per diver (all above included as well). Book 4 snorkelers for a full day trip to Saona Island with us for 155 USD per person (refreshment, drinks, lunch, private taxi from Punta Cana / Bavaro and back included), add 3 and more snorkelers for only 95 USD per person (all above included as well). 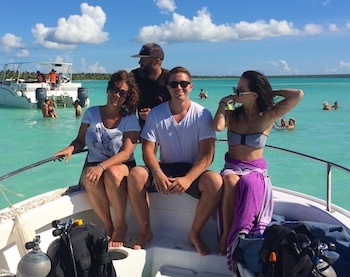 Book 2 divers as for the offer above and add 3 and more snorkelers for a day trip with for 95 USD per person (refreshment, drinks, lunch, equipment, transportation from Punta Cana / Bavaro and back included).